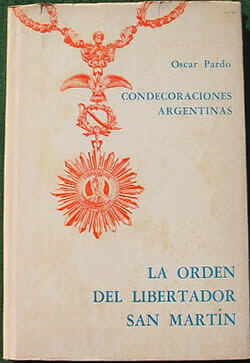 Oscar Pardo, Condecoraciones Argentinas, La Orden del Liberador San Martin (1972), 133pp, photographic illustration in text, red cloth with dustjacket. Sound. This appears to be an extremely well-researched and informative work. However it is in Spanish, a language with which I have only a passing acquaintance.